Acebutolol is a cardioselective, Î²-adrenoreceptor blocking agent, which possesses mild intrinsic sympathomimetic activity (ISA) in its therapeutically effective dose range. Î²1-cardioselectivity has been demonstrated in experimental animal studies. In anesthetized dogs and cats, acebutolol is more potent in antagonizing isoproterenol-induced tachycardia (Î²1) than in antagonizing isoproterenolinduced vasodilatation (Î²2). In guinea pigs and cats, it is more potent in antagonizing this tachycardia than in antagonizing isoproterenol-induced bronchodilatation (Î²2). ISA of acebutolol has been demonstrated in catecholamine-depleted rats by tachycardia induced by intravenous administration of this agent. A membrane-stabilizing effect has been detected in animals, but only with high concentrations of acebutolol. Clinical studies have demonstrated Î²1-blocking activity at the recommended doses by: a) reduction in the resting heart rate and decrease in exerciseinduced tachycardia; b) reduction in cardiac output at rest and after exercise; c) reduction of systolic and diastolic blood pressures at rest and postexercise; d) inhibition of isoproterenol-induced tachycardia. Vascular Effects: Acebutolol has less antagonistic effects on peripheral vascular Î²2receptors at rest and after epinephrine stimulation than nonselective Î²-antagonists. ISA has been observed with acebutolol in man, as shown by a slightly smaller (about 3 beats per minute) decrease in resting heart rate when compared to equivalent Î²-blocking doses of propranolol, metoprolol or atenolol. Chronic therapy with acebutolol induced no significant alteration in the blood lipid profile. Significant reductions in resting and exercise heart rates and systolic blood pressures have been observed 1.5 hours after acebutolol administration with maximal effects occurring between 3 and 8 hours postdosing in normal volunteers. Acebutolol has demonstrated a significant effect on exerciseinduced tachycardia 24 to 30 hours after drug administration. There are significant correlations between plasma levels of acebutolol and both the reduction in resting heart rate and the percent of Î²-blockade of exercise-induced tachycardia. CARDIAC FAILURE: Sympathetic stimulation may be essential for support of the circulation in individuals with diminished myocardial contractility, and its inhibition by Î²-adrenergic receptor blockade may precipitate more severe failure. Although Î²-blockers should be avoided in overt cardiac failure, acebutolol can be used with caution in patients with a history of heart failure who are controlled with digitalis and/or diuretics. Both digitalis and acebutolol impair AV conduction. If cardiac failure persists, therapy with acebutolol should be withdrawn. IN PATIENTSWITHOUT A HISTORY OF CARDIAC FAILURE: In patients with aortic or mitral valve disease or compromised left ventricular function, continued depression of the myocardium with Î²-blocking agents over a period of time may lead to cardiac failure. At the first signs of failure, patients should be digitalized and/or be given a diuretic and the response observed closely. If cardiac failure continues despite adequate digitalization and/or diuretic, acebutolol therapy should be withdrawn. EXACERBATION OF ISCHEMIC HEART DISEASE FOLLOWING ABRUPT WITHDRAWAL: Following abrupt cessation of therapy with certain Î²-blocking agents in patients with coronary artery disease, exacerbation of angina pectoris and, in some cases, myocardial infarction and death have been reported. Therefore, such patients should be cautioned against interruption of therapy without a physicianâ€™s advice. Even in the absence of overt ischemic heart disease, when discontinuation of acebutolol is planned, the patient should be carefully observed, and should be advised to limit physical activity to a minimum while acebutolol is gradually withdrawn over a period of about two weeks. (If therapy with an alternative Î²-blocker is desired, the patient may be transferred directly to comparable doses of another agent without interruption of Î²-blocking therapy.) If an exacerbation of angina pectoris occurs, antianginal therapy should be restarted immediately in full doses and the patient hospitalized until his condition stabilizes. PERIPHERAL VASCULAR DISEASE: Treatment with Î²-antagonists reduces cardiac output and can precipitate or aggravate the symptoms of arterial insufficiency in patients with peripheral or mesenteric vascular disease. Caution should be exercised with such patients, and they should be observed closely for evidence of progression of arterial obstruction. BRONCHOSPASTIC DISEASES: PATIENTS WITH BRONCHOSPASTIC DISEASE SHOULD, IN GENERAL, NOT RECEIVE A Î²-BLOCKER. Because of its relative Î²1-selectivity, however, low doses of acebutolol may be used with caution in patients with bronchospastic disease who do not respond to, or who cannot tolerate, alternative treatment. Since Î²1-selectivity is not absolute and is dose-dependent, the lowest possible dose of acebutolol should be used initially, preferably in divided doses to avoid the higher plasma levels associated with the longer dose-interval. A bronchodilator, such as theophylline or a Î²2-stimulant, should be made available in advance with instructions concerning its use. ANESTHESIA AND MAJOR SURGERY: The necessity, or desirability, of withdrawal of a Î²-blocking therapy prior to major surgery is controversial. Î²-adrenergic receptor blockade impairs the ability of the heart to respond to Î²-adrenergically mediated reflex stimuli. While this might be of benefit in preventing arrhythmic response, the risk of excessive myocardial depression during general anesthesia may be enhanced and difficulty in restarting and maintaining the heart beat has been reported with beta-blockers. If treatment is continued, particular care should be taken when using anesthetic agents which depress the myocardium, such as ether, cyclopropane, and trichlorethylene, and it is prudent to use the lowest possible dose of acebutolol. Acebutolol, like other Î²-blockers, is a competitive inhibitor of Î²-receptor agonists, and its effect on the hear t can be reversed by cautious administration of such agents (e.g., dobutamine or isoproterenol â€“ see Overdosage). DIABETES AND HYPOGLYCEMIA: Î²-blockers may potentiate insulin-induced hypoglycemia and mask some of its manifestations such as tachycardia; however, dizziness and sweating are usually not significantly affected. Diabetic patients should be warned of the possibility of masked hypoglycemia. THYROTOXICOSIS: Î²-adrenergic blockade may mask certain clinical signs (tachycardia) of hyperthyroidism. Abrupt withdrawal of Î²-blockade may precipitate a thyroid storm; therefore, patients suspected of developing thyrotoxicosis from whom acebutolol therapy is to be withdrawn should be monitored closely. INFORMATION FOR PATIENTS: Patients, especially those with evidence of coronary ar tery disease, should be warned against interruption or discontinuation of acebutolol therapy without a physicianâ€™s supervision. Although cardiac failure rarely occurs in properly selected patients, those being treated with Î²-adrenergic blocking agents should be advised to consult a physician if they develop signs or symptoms suggestive of impending CHF, or unexplained respiratory symptoms. Patients should also be warned of possible severe hypertensive reactions from concomitant use of Î±-adrenergic stimulants, such as the nasal decongestants commonly used in OTC cold preparations and nasal drops. CLINICAL LABORATORY FINDINGS: Acebutolol, like other Î²-blockers, has been associated with the development of antinuclear antibodies (ANA). In prospective clinical trials, patients receiving acebutolol had a dose-dependent increase in the development of positive ANA titers, and the overall incidence was higher than that observed with propranolol. Symptoms (generally persistent arthralgias and myalgias) related to this laboratory abnormality were infrequent (less than 1% with both drugs). Symptoms and ANA titers were reversible upon discontinuation of treatment. DRUG INTERACTIONS: Catecholamine-depleting drugs, such as reserpine, may have an additive effect when given with Î²-blocking agents. Patients treated with acebutolol plus catecholamine depletors should, therefore, be observed closely for evidence of marked bradycardia or hypotension which may present as vertigo, syncope/presyncope, or orthostatic changes in blood pressure without compensatory tachycardia. Exaggerated hypertensive responses have been reported from the combined use of Î²-adrenergic antagonists and Î±-adrenergic stimulants, including those contained in proprietary cold remedies and vasoconstrictive nasal drops. Patients receiving Î²-blockers should be warned of this potential hazard. Pregnancy Category B: Reproduction studies have been performed with acebutolol in rats (up to 630 mg/kg/day) and rabbits (up to 135 mg/kg/day). These doses are equivalent to approximately 31.5 and 6.8 times the maximum recommended therapeutic dose in a 60-kg human, respectively. The compound was not teratogenic in either species. In the rabbit, however, doses of 135 mg/kg/day caused slight fetal growth retardation; this effect was considered to be a result of maternal toxicity, as evidenced by reduced food intake, a lowered rate of body weight gain, and mortality. Studies have also been performed in these species with diacetolol (at doses of up to 450 mg/kg/day in rabbits and up to 1800 mg/kg/day in rats). Other than a significant elevation in post-implantation loss with 450 mg/kg/day diacetolol, a level at which food consumption and body weight gain were reduced in rabbit dams and a nonstatistically significant increase in incidence of bilateral cataract in rat fetuses from dams treated with 1800 mg/kg/day diacetolol, there was no evidence of harm to the fetus. There are no adequate and wellcontrolled trials in pregnant women. Because animal teratology studies are not always predictive of the human response, acebutolol should be used during pregnancy only if the potential benefit justifies the risk to the fetus. 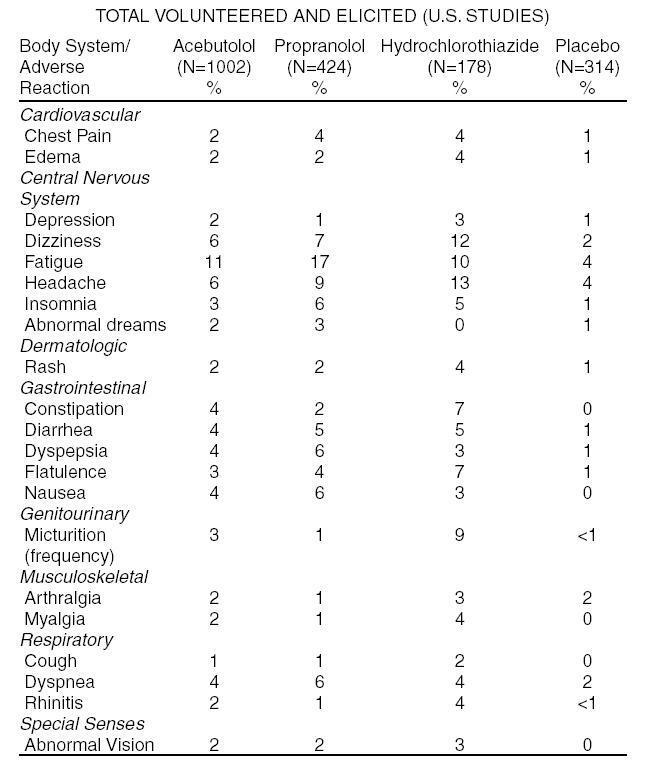 In addition, certain adverse effects not listed above have been reported with other Î²-blocking agents and should also be considered as potential adverse effects of acebutolol. Miscellaneous: Reversible alopecia and Peyronieâ€™s disease. The oculomucocutaneous syndrome associated with the Î²-blocker practolol has not been reported with acebutolol during investigational use and extensive foreign clinical experience. 4. Bronchospasm: A theophylline derivative, such as aminophylline and/or parenteral Î²2-stimulant, such as terbutaline. 400 mg: Size â€œ2â€ hard gelatin capsules with bright orange opaque body printed radially â€œ670â€ with black ink and lavender opaque cap printed radially â€œAmnealâ€ with black ink.